Venezuelan pianist Leo Blanco is a genuine virtuoso with a huge musical personality. His music is rooted in the Africa-Latina rhythms of his homeland and enriched by the vast knowledge of jazz and understanding of the classical tradition that you might expect from a professor of piano at America’s premier music college, Berklee. His solo concerts are enthralling and rhapsodic displays of technical command and emotional communication, showing why on previous visits to Scotland Blanco has earned five-star reviews from The Scotsman and The Herald, drawn standing ovations at Aberdeen Jazz Festival and is the proud winner of a coveted Bank of Scotland Herald Angel, awarded for outstanding performances during the Edinburgh Festival. I guess our reviewing team will be tossing coins, drawing straws or indulging in handbags at dawn over this one. October 18 sees Jamie Cullum at Sage Gateshead and legendary trombone funkster Fred Wesley at Hoochie. He may be best remembered by the general public for his stills of Marilyn Monroe, Elizabeth Taylor and other Hollywood stars but the jazz fraternity will always associate Bert Stern as the director of that iconic documentary of the 1958 Newport Jazz Festival - Jazz on a Summer's Day. A camera talent of the highest degree we must regret that he didn't make more film documentary's for he had a rare talent in that direction. Bert Stern died June 26 age 82. For over two weeks (July 5 - July 21) Durham City and several surrounding villages will resound to the sound of brass instruments - heard in many different formats. Marching Bands, Brass Bands and various jazz inspired outfits. For readers of this blog the outstanding event will most surely be the Scottish National Jazz Orchestra's presentation - In The Spirit of Duke. Held in the Gala Theatre on July 8 this is an opportunity to hear, in my opinion, the number one big band in the UK and possibly elsewhere if reports of their recent visit to New York are anything to go by! Tickets are £17.50 and £12.50 (concessions). Don't miss out they are simply sensational! Other delights include The Northern Monkey Brass Band, Hannabiell and Midnight Blue, the Baghdaddies, New York Brass Band, Jazz in my Pants and many more. It's Personal is an apt title for a solo piano album. No bass player to lean on, no drummer to help you swing, no guitarist to share the harmonic load. No, there's nobody but yourself or rather, in this case, Texas born Mike Wofford. Wofford relocated to LA in the 1960s where he worked with Chet Baker, June Christy, Art Pepper and many other of the leading West Coasters. Later he became MD for Ella Fitzgerald. Wednesday July 3 is the date - Cleveland Bay, Eaglescliffe is the place - watch this space. 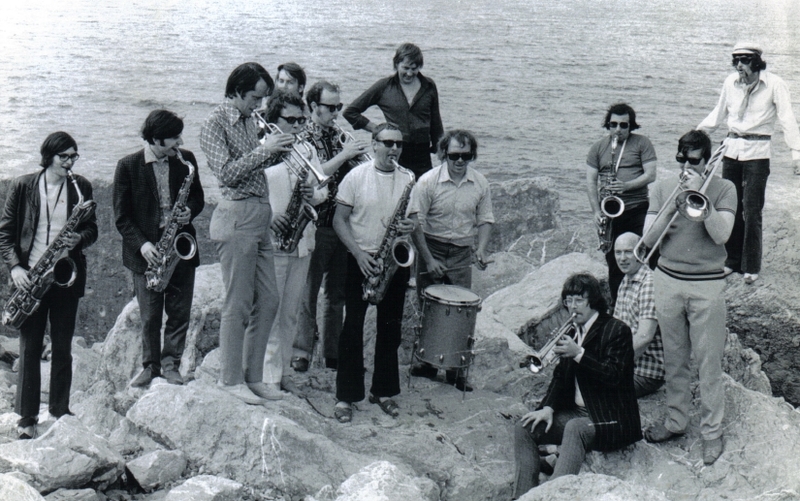 Gabriele Heller (vcl); Dave Parker (bs); Steve Glendinning (gtr) + Paul Grainger (bs) and several.others. Tonight, down in Soho, Sarah Ellen Hughes gave a farewell performance at The Spice of Life prior to returning to primary school teaching - from one jungle to another! We wish her well and have fond memories of her north east appearances at the Cherry Tree, Customs House and Sage Gateshead (with Sector 7). So what has this to do with the Star Inn on Westgate Rd.I hear you ask? Tonight was very much like the Wednesday nights at "The Spice" that I so much enjoy when I'm "in town" rather than "toon". (Review by Russell - photo by Jerry Edis). The evening’s celebrations continued with the eagerly awaited return of drummer David Carnegie. Having lived in the north east for a number of years studying and working, Carnegie went home to Barbados a couple of years ago. It was quite something to see him on stage at Sage Gateshead in the company of band mates Stefan Walcott (piano) and bassist Neil Newton. 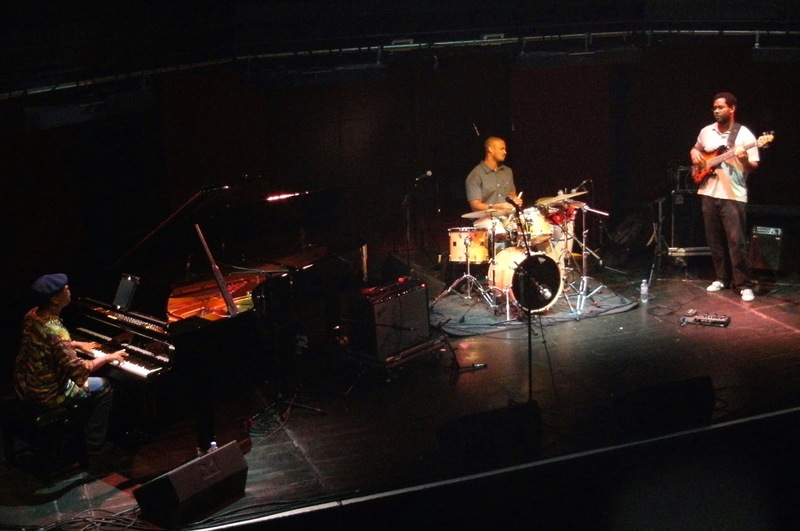 North East Jazz CelebrationPart 1 - The Graeme Wilson Quartet. June 25. Graeme Wilson (ten); Paul Edis (pno); Andy Champion (bs); Adam Sinclair (dms). The first of a 3 band set in this Jazz North East/Sage Gateshead collaboration which was also part of a bigger picture - The Festival of the North East. All the compositions were by Graeme and had been heard earlier in the month at the Lit and Phil. Not that this diminished the content, in fact, if anything, familiarity brought greater understanding. Hi Lance, I had to comment on this amazing pic, my Dad was John Pearce, so anything showing a picture of him is so precious, am so pleased to have found your San Sebastian & Newcastle Big Band photos! thanks again! This show was recently performed at the Sage (see Lance’s review), so it is interesting for me to compare the CD with the live performance. This is not a jazz CD, but rather a concept album, all about a woman collecting debris from the seashore which arouses memories from her life and experience. The music has elements of folk, jazz, music hall, and pop. It’s obvious from the musical instruments and effects listed above that the sounds are cleverly constructed, especially those portraying the sea, sounds of waves and underwater mystery. The live performance had the added attraction of an effective light show with lots of blue and green. The songs have a strong narrative element, exploring different aspects of the sea and seaside life. James Harrison (pno); Ian Simpson (gtr); James Robson (bs); Dave Donnelly (dms). The Cherry Tree these days seems to be a home from home for our top pianists. Paul Edis, Jeremy McMurray, Alan Glen, Alan Law, Dean Stockdale, Peter Gilligan and Stuart Collingwood have all appeared here. James Harrison has done solo gigs here but this was a first appearance with his quartet. Was he intimidated by his peers? If he was it didn't show. A first rate performance by a young man who can hold his own in any company, tonight was an absolute delight. Re the Ray Chester Tribute concert reviewed below, I omitted to mention that the event was recorded so if you didn't make it you can hear it as it happened and if you were there you'll have a lasting momento. To be advised of its release, email: raychestermusic@btopenworld.com. Ray Chester Tribute Concert @ The Customs House June 23. Don Fairley, Keith Norris, Caroline Norris, Dave Brock, Alan Bravey (tmb); Mark Webb, Graham Hardy, Dave Hignett, Gordon Marshall, Mick Hill (tpt); Steve Summers, John Hudson (ten); Andy Bennett, Kim Webb (alt); Niall Armstrong (bar); Colin Haikney (pno); James Birkett (gtr); Ray Truscott (bs); Stuart Haikney (dms); MIA WEBB (vcl). They came to praise Caesar not to bury him - to paraphrase The Bard. Caesar, or rather Ray Chester, was very much alive at the Customs House on this very emotional farewell. The bandleader, composer, arranger, trombonist, pianist, trumpet player, teacher and you name it, was here tonight. Here, in the arrangements he wrote, his compositions, and the band he crafted into an award winning outfit. Two hundred of us listened and applauded the music that was laid down. Musically speaking this was a banquet, no dogs dinner this feast!. Thanks to Paul Edis for drawing attention to this on Facebook. I don't normally listen to Desert Island Discs as I find Kirsty Young’s line of questioning too intrusive, but I made an exception today as the castaway was comedian, actor and jazzman Hugh Laurie. He talked about his career and his choice of records included the Lester Young/Buddy Rich Trio playing I Cover The Waterfront; Van Morrison’s Brown Eyed Girl; and a song by Sister Rosetta Tharpe - My Journey to the Sky. For his luxury he chose to have a set of throwing knives, which I found both amusing and worrying. Listen to this for yourself on the BBC iplayer, or catch the repeat on Friday morning at 9am on radio 4. Today I went to the Westoe Fete in South Shields. The last time I visited this picturesque event was quite a few years back. On that occasion I picked up a copy of John Chilton's Who's Who of British Jazz. An invaluable tome of reference. This time round I'd reached almost the last stall empty handed when, lo and behold, it appeared - a novel by Gilad Atzmon My One and Only Love. At 50p it was not to be passed by. However, it is done in such a humourous way that it is difficult to take offence although I am sure many did in 2005 when it was published and thinking back to earlier this year and the controversy that cancelled his appearance at the Star and Shadow one wonders of the reaction had word got round that a copy of a book by Gilad was on sale in Westoe Village! 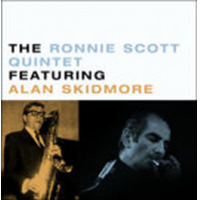 LP Review: The Ronnie Scott Quintet Featuring Alan Skidmore. Ronnie Scott/Alan Skidmore (ten); Gordon Beck (pno); Jeff Clyne (bs); Johnny Butts (dms). Recorded Paris Studios Lower Regent St., London. BBC Jazz Club "The Jazz Scene" March 27, 1966. There's something satisfying about a circular piece of 12" vinyl. For a start the sleeve notes the disc is enclosed in are readable - a major bonus when, as in this case, they are written by Simon Spillett who knows a thing or two about sax playing. Video from recent Trinity Centre, Gosforth concert by Keith Nichols with the Swing City Trio. Steve Andrews on reeds, Roly Veitch on guitar and vocal, Roy Cansdale on bass and, of course, Keith Nichols on piano. Check out more videos from Mary B Jazz on YouTube. Rendezvous Jazz @ The Black Horse, Monkseaton. June 21. Midsummer. A pint of Caledonian Sunseeker. Rendezvous Jazz played to a full house in Monkseaton. The band started late, bandleader Maureen Hall apologised for the delay - somehow or other Roy Gibson’s keyboards got lost en route. What to do? Make a start, improvise in the best possible fashion. Well, would you believe it? The Black Horse has its own piano. An upright, supposedly out of tune, pushed up against a wall was pressed into action. What a bonus, an acoustic piano rather than an electric piano! Maureen, shouldn't have apologised. Chip Stephens is a pianist out of Bill Evans by way of say Sonny Clark, Bud Powell, Peterson and early Jarrett. He doesn't use the piano as a harp or pummel it into submission. The piano is the most wonderful instrument in the world and should be accorded the respect it deserves. Abuse of, say a Steinway, to me, is akin to defacing the Mona Lisa or watching the X-Factor. Do what you like to a keyboard but please don't mishandle a grand piano. 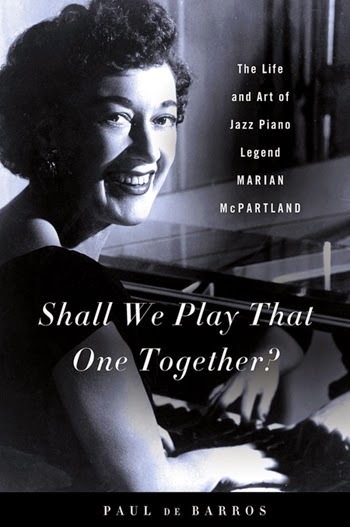 Paul de Barros has won the Jazz Journalists Association award for Jazz Book of the Year for his biography of Marian McPartland "Shall We Play That One Together?" A good call (and a good read). Over the past few years, on my trips to the UK, I've played on the Newcastle to Carlisle Jazz/Real Ale Train, with Brian Bennetts Vieux Carré Jazzmen, it has just celebrated 175 years of the line being open, and has some views of the most beautiful country side in the UK. John Gillot who is interviewed here is the man behind the idea for the Jazz/Real Ale Train, hopefully it will be back on next year, 2014. http://www.bbc.co.uk/news/uk-england-22964478. Clarinetist Peter Hepplewhite called the first number, a stately take on Misty featuring a round of solos and a vocal from bandleader Dave Weisser. Autumn Leaves introduced a new voice, that of trumpeter Jack Courtney. Of the new generation, the trumpeter took a muted solo with no little confidence and it was down to Weisser to pluck the lyrics from his memory bank of tunes. Peter Gilligan (pno); Steve Glendinning (gtr); Paul Grainger (bs); Mark Robertson (dms) + John Rowland (ten); John Pope (bs); Peter Ninnim (dms). C Jam Blues, always a good number to warm up on, kicked things off and it was apparent that all four were going for gold. Opus de Funk, Hymn to Freedom, Horace Silver's Quicksilver and Summer in Central Park were but some of the numbers that made for a lively first set. The balance wasn't perfect but the solos were. - a study course, starting 09:30 Tuesday October 1, at the Wylam Institute. Five weekly 2-hour sessions, costing £15 for the course. In this second series we confront the abundance of twentieth century. popular music, their ancestry, development, maturity – some 300,000 songs were written! 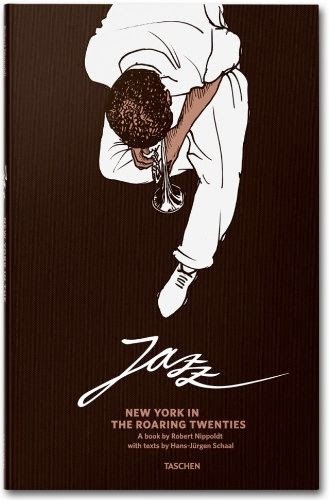 We'll examine the vibrant, mixed ethnic seedbed of musical life in that early & mid-century Manhattan. We'll explore the songs of the ‘second line’ songwriters who enriched the great ‘book’ over some six decades. We may not know all their names but we bought records, listened to, sang and danced to their songs. The Jazz Blowers' end of term concert takes place on July 16 in the Hadwin Lounge of Hurworth Grange Community Centre nr. Darlington. An opportunity to get in on the ground floor and hear the stars of the future. £5. 7pm start. Brian Landrus (baritone sax & various 'low reeds'); Nir Felder (gtr); Lonnie Plaxico (bs); Rudy Royston (dms); Frank Carlberg (pno/keys); Mark Feldman (vln); Ryan Truesdale (cond. ); Feldman String Quartet. Composer Landrus - Master of the Low Reeds - has created an intriguing album that merges his quintet Kaleidoscope with the Feldman String Quartet. The 'low reeds', apart from baritone sax, comprise bass clarinet, bass flute, contra alto flute and bass saxophone all played by 'The Master' at varying times. That he is adept (or should that be adepth?) on these subterranean horns goes without saying - he's been a Down Beat Rising Star on bari for the past 3 years. Our reviewers couldn't get to Blaydon for Djangologie's gig last Sunday (June 16) but our camera man John Marler did. Newcastle Jazz Festival 1986 - 29th St. Saxophone Quartet. Great line-up, I saw Courtney Pine, John Surman Tal Farlow and 29th St Sax Quartet. A lot of the gigs were recorded by Metro radio, I used to have the 29th street Sax Quartet at the Newcastle Playhouse on tape but lent it to someone and never got it back. I'd love to hear it again, does anyone have a copy, I've got bits of it but not the full gig? Splinter at the Bridge is a ‘must get to’ gig. Every Sunday night in the upstairs room of the Bridge Hotel perched high above the Tyne there is a guarantee of excellence. This week’s guests - the Toby Boalch Sextet - were no exception. Hailing from Birmingham, the musicians must have been disappointed to see so few faces take their seats. Other bands have played to a similarly sparse turn-out in recent weeks. Tyneside’s jazz audience is large in number yet reluctant to make the effort to get to gigs. Recreating their 1979 album Light as a Feather, Azymuth laid down their own particular brand of samba jazz and 70's Brazilian pop. Repetitious it may be yet, nonetheless, the compulsive rhythms wind their strings around your heart attuning your pulse into theirs. Steve Swallow (bs); Carla Bley (org); Chris Cheek (ten); Steve Cardenas (gtr); Jorge Rossy (dms). Textural is a word Steve Swallow uses in the press release to describe this 12 track, no discernible separation, album and it nicely sums up the pastoral rich opener Sad Old Man. The title track, Into the Woodwork, has similar underpinnings but above it all Cheek emerges with a solo worthy of any of the great Blue Note tenormen. A Berklee graduate I wasn't familiar with his work but he has appeared on over 60 albums including several under his own name. Likewise Cardenas, he too has a prolific recording background and worked with Cheek in the Paul Motian Band. His playing on the album is clean and lyrical, keeping the melodic content flowing. Keith Nichols and the Swing City Trio @ Trinity Centre, Gosforth June 15. Keith Nichols (pno/vcl); Steve Andrews (ten/sop/clt/vcl); Roly Veitch (gtr/vcl); Roy Cansdale (bs). The Swing City Trio went into a rhapsodic version of Darn That Dream with Andrews giving an unbroken rendition á la Coleman no, not Ornette, but the high and mighty Hawk filling the crowded room with his big sound. Just the usual reminder of our concert this coming Sunday. Djangologie capture the essence of Django Reinhardt & Stephane Grappelli. Acoustic, gypsy swing at its best. Emma Fisk vln, James Birkett & Giles Strong gtrs, Mick Shoulder bass. Preview: Azymuth @ Hoochie Coochie Sunday June 16. Azymuth are said to be, "quite simply some of the best musicians in the world". On their last visit to Hoochie Coochie they astounded everyone with their ability, I'm told it was easily one of the best gigs Hoochie have ever had. Class . Smooth , chilled, jazzy but also funky & always with that latin vibe. Hoochie owner Warren says, "Do yourself a favour & come see them . Last time we charged you £20 , this time we wanna fill it so tickets are only £12 !! Formed in 1972 , the band performed as a trio until Roberto Bertrami's death in July 2012. Tonight they will perform as a quartet with Roberto's son replacing him & adding a percussionist. This Sunday's Splinter gig at the Bridge, Newcastle features the exciting Birmingham based Toby Boalch Sextet. To give you an idea where they are at Zoe Gilby asked them a few questions to give the regulars (and hopefully others too) of what to expect. It looks good to me. Budtones had a great Gig at Pizza Express, Dean St., Newcastle. Management and staff were very supportive. Highly Recommended. The band were on form and the audience was very receptive. Unfortunately, Mike Papapavlou played his last gig with us as he is off to New York. Super Guy and Great Guitar player. Harley Johnson is stepping into the breach on piano for for next two gigs. Ashington Jazz Club on July 3 is the first..
Graeme Wilson Quartet @ The Lit and Phil, Newcastle. There's a certain olde worlde charm about the Lit and Phil. An imposing, slightly decaying facade (understandable as it's been around for 320 years), that nevertheless has of late provided the setting for many excellent concerts across the jazz spectrum. This afternoon's performance by the Graeme Wilson Quartet must surely rank high on the list of jazz achievements attained within its hallowed walls. Who knows but that one day there will be portraits of these four musicians adorning the walls alongside the dignitaries who currently look down? By this preamble you'll have guessed it was a good gig! How do they do it? How can you make complex, edgy, demanding music instantly engaging? Not only that, but music that is highly expressive and beautiful too? Well, the Slowlight Quartet may comprise of four highly accomplished musicians; Tom Quilliam sax, Paul Loraine keys, Ian ‘Dodge’ Paterson bass and Jonathan Marriott drums, each with exceptional intonation, making beautiful sounds, but the whole is bigger than the parts. So it’s not a matter of just a locked in- tight as owt – rhythm section with a jaw droppingly wonderful saxophonist, but a band enmeshed in the communal groove. The Slowlight Quartet share a musical brain. Look them up on www.theslowlightquartet.co.uk and get yourself to a gig. Jazz North East’s On the Outside strand gave a long-overdue north east of England debut to high profile New Yorker Tom Rainey. A veteran of countless sessions, his appearance at the Bridge Hotel drew a bumper crowd and it was standing room only long before the start of the first set. German born, New York resident, tenor saxophonist Ingrid Laubrock is firmly established on the Big Apple’s Downtown scene. Anthony Braxton alumni are many, and one of the brightest of his shining stars - guitarist Mary Halvorson - formed the third element in Rainey’s trio. Just heard that guitarist Johnny Smith died yesterday (June 12) aged 90. One of the all time greats. I guess, like many jazz people, it was his version of Moonlight in Vermont with Stan Getz that first brought him to my attention. In particular the rich harmonies and a rather wonderful run at the end of the tenor solo. For 1952 this was as much the epitome of 'cool' as anything that Chet and Gerry were doing. Smith seemed at home with tenorists - as well as Getz he recorded with Zoot Sims, Paul Quinichette and Frank Foster. However, one has to wonder what direction his music would have taken if he hadn't opted out of the main scene to teach and run a music store?. Sadly another icon has gone although not without leaving us a treasured recorded legacy. PS: Above - Johnny Smith pictured right with Barney Kessel. (Photo courtesy of Maurice Summerfield). PPS: Letter from Johnny Smith to Maurice Summerfield dated December 28, 2008. Gwyneth Herbert - The Sea Cabinet - @ Sage Gateshead June 12. Gwyneth Herbert (vcl, pno, uke, various perc inst), Fiona Bevan (vcl, pno, uke, gtr, vln, various perc inst); Al Cherry (gtr); Sam Burgess (bs); David Price (dms, vln, glock, various inst); Burnside College Choir, Wallsend) (Pirates Chorus). A short, but well received opening set by Bevan (right) culminated with the curly permed singer / songwriter / guitarist being joined by Herbert for a brief taste of the main event. I use the word main advisedly as The Sea Cabinet was indeed a suite/story, with words and music by Gwyneth Herbert, based on people, places and sea related artefacts. L. Your new album, “The Sea Cabinet”, was launched last month at Wilton’s Music Hall but the actual tour proper commences tonight – that’s June 12 – at Sage Gateshead. GH: That’s right. This is our first large-scale UK tour for a while, and many of the venues have a particular resonance with me and the project. When I first sang at Wilton’s three years ago, I fell immediately in love with it. It's the oldest surviving Grand Music Hall in the world and it feels as if the very walls whisper with the ghosts of cabaret past; seems to me the most perfect location in which to launch our story-web of sea songs. I also love The Sage – it’s a great space to play, and I've developed my relationship with the venue by working and performing there in a variety of different guises over the last ten years or so. To complement his tribute to Mike Durham and the West Jesmond Rhythm Kings, Roly Veitch has sent me some superb photos of the WJRK (sadly without Mike who is pictured left in a publicity shot kindly supplied by Patti Durham) including a shot with Patti, the family and the band by Andy Wilson at this year's Bute Jazz Festival. Gwyneth Herbert released her new album The Sea Cabinet, on the 20th May 2013. The Sea Cabinet, the singer’s sixth album and her first in three years, was launched with four nights at Wilton’s Music Hall – the oldest surviving music hall in the world. Her subsequent tour, her first in four years, will start at Sage Gateshead and culminate in a show at Snape Maltings, where the whole project was conceived and recorded. A second tour has already been confirmed for the autumn. From Our Girl in China - Zoe Gilby Reports from Fengqingju International Jazz Festival..
"We did the first gig and it went really well. The audience was around three thousand Chinese!! The stage setup was like something from Glastonbury festival main stage. Filmed with top of the range camera equipment that was projected directly onto an enormous screen backdrop. They played some of my youtube videos on the screen before we went on and the play-on music was like something from the X Factor final. Although obviously not a "jazz crowd" I've never experienced such an enthusiastic audience before. Cheering and waving as soon as we got on stage. They treat you like you're really famous. When I introduced the guys they all cheered wildly but they went totally crazy when I introduced Andy as my husband, they seem to really like that. I moved around the stage a bit and anytime I went up to the edge that whole section of the audience went nuts! Cheering, waving and blowing kisses. After the set we were bombarded with autograph signing and posed pictures, even from the security staff. It was surreal but fantastic. We've had a taste of how the other half live!!" Matt Roberts Quintet pay tribute to the great…Lee Morgan. So said the flyer around the Forum Music Centre. The bar was packed, the main hall would soon be similarly crowded to welcome home trumpeter Matt Roberts. A Darlington lad made good, Roberts served his apprenticeship in the ranks of the County Durham schools’ big bands, moved on to further his studies in Leeds, then London and here on home turf he was to be given a hero’s welcome. His quintet boasted some familiar names and faces from the Leeds scene - Matt’s frontline partner and namesake tenor saxophonist Matt Anderson, the two Sams - Vicary (double bass) and Gardner (drums) - and recent Leeds College of Music graduate, pianist Declan Forde. Sue Ferris and Paul Edis Trio @ The Cherry Tree, Jesmond. Sue Ferris (ten/fl); Paul Edis (pno); Paul Susans (bs); Rob Walker (dms). A day at the office type gig and none the worse for that. All four musicians were relaxed and worked their way through a tried and tested selection of standards with a couple of jazz classics (Doxy, Blue Bossa) thrown in for good measure. A nice swingy My Romance set the right groove followed by Taking a Chance on Love. Sue went into orbit on this one with a cracking solo. Just Squeeze Me, Doxy, Alice in Wonderland (on flute) and All the Things You Are to round off the first set. Until now, I'd never come across Metamorphic, who describe themselves as “a contemporary song-based jazz/folk sextet”. They've been around awhile. Coalescence is their second album, and is “a collection of largely song-based emotional journeys…some of which is inspired by dreams”. Whilst their self-penned description didn't do much for my levels of enthusiasm or anticipation, having now heard the album, it sums them up quite well. Once I put the CD in the player, any prejudices I might have been harbouring following the press blurb were immediately blown away. Lloyd Wright (gtr); Jon Proud (bs); David Francis (dms). What can one say? This is the jazz version of Cream or maybe Forty Years After. Whatever, the triumvirate take jazz rock to an exalted level. Lloyd is the spiritual descendent of the Tyneside jazz dynasty that weaves its way from Charlie Smith via Roly Veitch, John Hedley, Terry Ellis, James Birkett, Rod Sinclair, Mark Williams to Lloyd and (in a different direction) Bradley Johnston. Keith Tulip mentions (on F/b) playing with The Char Wallahs. This brought the following memory back to me. Some years ago I was cycling through the tiny Northumberland village of Capheaton (pop 160) when I saw a poster pinned to a tree. I got such a shock I almost fell off my bike! I've reproduced the poster here from memory. Debra Milne Ensemble: Northumberland Tennis Club, Jesmond: Friday June 7. What could be better than jazz on a sunny summer’s evening in West Jesmond, sitting in a pleasant bar, with a view of leafy tennis courts? Debra said the band was feeling suitably relaxed and mellow (this was before they'd had a drink!). The two sets included lots of Latin numbers as well as some Horace Silver, and they produced rather a lot of musical excitement among the mellowness. Well done! Gavin Lee's Dixie Band @ Ashington Jazz Club June 5. Gavin Lee (Soprano Sax. ), Don Fairley Trombone. Dan McKeown (Banjo), Phil Smith (Bass), Steve Doyle (Drums). Ric Harris (gtr); Micah Rutschman (vbs); Mason Cormie (bs); Tom Haugen (perc) + Daniela Bisenius (vln); Jack Scott (fl). Beautiful - a breath of fresh air amid some of the current sounds that are passed off as jazz. Reminiscent of the MJQ but with the feel of today about it I simply adored this. Rutschman on vibes hits the perfect medium between the richness of Hampton and the sometimes "milk bottle"sound of Jackson. Harris is ahead of the game both as player and composer and is ably supported by Cormie and Haugen. Here's a YouTube clip of the vibists New York Uni Audition for his Jazz Masters Vibraphone degree. Northern Monkey Brass Band - The Boiler Shop, Newcastle. Graham Hardy, Alistair Lord (tpt); David Gray, Mark Ferris (tmb); Jamie Toms (ten); Brendan Murphy (bass drum); Alex Tustin (snare dm); Phil Rosier (tuba). This was the third of the monthly "Steamers" held in "The Robert Stephenson Boiler Shop" and the first one that I'd attended - or even heard of! As the venue's name implies, in Victorian times, Robert Stephenson, son of George Stephenson, produced locomotive parts including boilers which led to the family becoming world leaders in the early days of locomotion. On a sunny day like today, midst the beer, food and other attractions it was hard to imagine its industrial past although, take away the bars, the food stalls and the bric-a-brac, the fading walls and the iron girder beams may well have reminded you. Johnny Deps in Crook - Paul Edis Sextet at St. Cuthbert’s Centre, Crook, Friday 7, June 2013. Paul Edis (Piano), Mick Shoulder (Bass), Adam Sinclair (Drums), Graeme Wilson (Tenor Sax), Chris Hibbard (Trombone) and Johnny Dunn (Trumpet and Flugelhorn). 7.30 p.m., summer sun (about time) streams through the high window, nibbles are on the tables, bottled ales are flowing and a chattering Crook crowd thinks they are in for a great evening. Adam’s drums rip into Administrate This, the chattering stops and the crowd know they are in for a great evening! Bring one of the region’s best bands to one of the region’s most welcoming venues and how can you fail? A toyshop, a youngster’s dream. I'll have two sets of, let me see…hard bop, please. Toyshop, a quintet, got together at Trinity London, each member having fingers in numerous jazz jam jars and of late have acquired a taste for the music of the late, great, hard bop trumpeter Clifford Brown. It was t-shirts and jeans on the stand but the music was that of the sharp-suited American heroes of the era; Brown, Roach, Blakey, Rollins and co.. Toyshop, unassuming, polite and so, so good. Cool, committed to the music, the frontline horns played unamplified and piano, bass and drums had their volume levels spot-on right from the start. North East Four (NE4) @ The Star Inn, Newcastle. June 5. Paul Gowland (ten); Alan Law (pno); Ray Truscott (bs gtr); Paul Wight (dms). Now TV have been in touch, and have told me that they have the Ned Kelly's 40th Anniversary documentary that was shot last December, now on Youtube, they have told me that an English version will follow soon, so for those of you who missed it, and who are not on Facebook, here it is in 3 parts, with some extra stuff which was not used when it first went out. Ned Kelly's Documentary Part One. Ned Kelly's Documentary Part Two. Ned Kelly's Documentary Part Three. A Brace of Albums from Satoko Fujii - Time Stands Still & Spring Storm. Satoko Fujii is a Japanese classically trained avant garde pianist, multi bandleader and composer and that information is probably enough for you to decide whether you will enjoy these CD’s or not. However if you are willing to give ‘Free Jazz’ a go then I'm sure you will get a lot out of these fascinating and intricate discs. Bass player Ben Tucker died after being hit whilst driving a golf cart across a road. Tucker, 82, had a long jazz pedigree and appeared on many recordings. Nikolaj Hess (pno); Tony Scherr (bs); Kenny Wollesen (dms). Denmark's Nikolaj Hess has combined with Scherr and Woolesen to produce an album that emphasizes the lyrical and poetic, mood-filled and simple, raw, unpolished and yet virtuosity and refined.. So reads an extract from the blurb. I found it contained a delightful, reflective, almost pastoral use of light and shade. This was just so romantic! Not Wham Bang Thank You Mam rather the progression of a genteel courtship. An expression of love with only an undertone of lust as Hess displays a classical feel without loss of the jazz mood. If Chopin had been born in New York and received tuition from say Bill Evans or Keith Jarrett he may have sounded like this - even on the Bob Dylan pieces such as Make You Feel My Love (the courtship begins) or Masters of War (the passions intensify). It is with great sadness that we report the passing of tenor saxophonist Jack Laing. Jack played in innumerable bands for over 60 years - latterly with the Duggie Pugh group, the Tees Hot Club and was a founding member of the Musicians Unlimited Big Band. Jack was a great player with a wicked, dry sense of humour and a real pleasure to have on the bandstand. He was also a fine tutor who taught and influenced many players in the North East. The funeral arrangements for Jack Laing are as follows. Friday 7th 3.30 pm at St. Bedes Crematorium Middlesbrough and then from 4.30 pm back at Guisborough Rugby Club for the rest of the evening. Danny Allan’s band is playing but if any other musicians want to join in they are very welcome. He will be sadly missed. Jacob Varmus (tpt/keys); Kris Davis (pno); Nate Radley (gtr); Jacob Garchik (acc); Ike Sturm or Gil Smuskowitz (bs); Brian Woodruff (dms/glock). For some unknown reason I keep shuffling this one down to the bottom of the pile of review CDs that are threatening to takeover house and home. I shouldn't do this because Terminal Stillness is a far better CD than some of those discs that are further up the pecking order. "A feast for the connoisseur, an appetizer for the novice" - so wrote DIE ZETT, Hamburg. This German book also won a European Design Award as The Most Beautiful Book in Germany and deservedly so. A 144 pages 340 mm x 220 mm hardback, it lives up to the above descriptions and more.The text by Hans-Jurgen Schaal may not offer any startling new insights into New York's jazz scene in the "Roaring Twenties" but he writes attractively with lots of anecdotes that paint pictures of the 24 subjects not just as musicians but as persons - or should I say personalities because they certainly were! Leazes Park became a mass of people, lots of swirling colourful clothes, Chinese, Italian, Turkish food for sale, holistic healing therapies available, juggling, hula hoops, acrobatics, face-painted children everywhere, and of course lots of publicity for green issues. On to the stage stepped the band, tension gradually building during the setting up, drums, repeated word riffs, a few whistles, then a drumming call to arms and we’re off, people dancing from the start. Long pieces, tempo accelerating, volume approaching a climax then, more gently, quietly coming to an end. You’ll hear sax, bass trombone - sounding wonderfully obscene - pounding drums, guitar, a cheeky whistle to get your attention, powerful riffs, ‘free yourself to my rhythm’ shouts Hannabiell over and over again, and the dancers obey. I notice a child sitting on her mother’s shoulders, drumming the rhythm out on her head. Poor Mum! A great session, seriously elemental rhythms. This is a totally enjoyable CD, but it mostly doesn't have that certain feel of ‘jazz’ (I'm open to contradiction from anyone else who hears it), except for some jazz influence on 3 of the tracks. Danish Ms Norby sang in the classical music world until she was aged 14, when one day she heard Creedence Clearwater Revival at a school party, which changed her musical perspective. Nowadays, she prefers not to have much regard for musical genres. I was fascinated to read in the CD insert that Nat King Cole actually started out as a jazz pianist and George Benson was originally a jazz guitarist (you probably all know this!). Benson was born in 1943, just as Cole was starting to make it as a singer. The CD is historically interesting for me as I remember, as a child, hearing Cole on the radio and absorbing the songs without realising that I was doing so. I need hardly say that this is a very worthwhile compilation, with fine big band playing, short solos from trumpet, piano and, naturally, guitar. and very pleasing singing from Benson and the two ladies who join him for duets on some tracks. Benson manages to stamp his own identity on these immortal songs without losing the spirit of the originals.